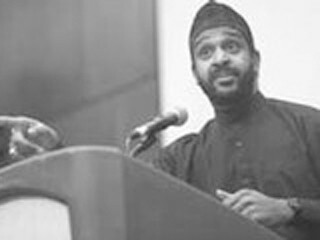 Malik Ali at UC-Irvine: Obama a "Deception"
Imam Abdul Malik Ali spoke to University of California-Irvine students as part of the Muslim Student Union's "Islam Awareness Week." Two weeks after Barack Obama's election as the nation's first black president, Malik Ali told students not to expect much difference. about FOX. The corporate media can get you to hate whoever they want you to hate. 'Saddam is good. Saddam is good.' Joe the Plumber says 'Saddam is good. Saddam is good.' And then the media says 'Saddam is bad, Saddam is bad.' Joe the Plumber says 'Saddam is bad, Saddam is bad.' The media can make you to hate or love whoever they want you to. How come the media didn't make America hate Obama? Where is getting $150 million in a month? Where is he getting three quarters of a billion dollars to run a campaign? Three quarters of a billion dollars to run a campaign. Barack Obama is a deception; a very dangerous, dangerous deception. Because we look at him and we say 'change.' And he chose Rahm Israel Emmanuel as his chief of staff. 'Change.' Madeleine Albright can go and represent him at the economic summit. 'Change.' David Axelrod, chief advisor Zionist. 'Change.'"